Observational studies on mechanical ventilation (MV) show practice variations across ICUs. We sought to determine, with a case-vignette study, the heterogeneity of processes of care in ICUs focusing on mechanical ventilation procedures, and whether organizational patterns or physician characteristics influence practice variations. We conducted a cross-sectional multicenter study using the case-vignette methodology. Descriptive analyses were calculated for each organizational pattern and respondent characteristics. An Index of Qualitative Variation (IQV, from 0, no heterogeneity, to a maximum of 1) was calculated. Forty ICUs from France (N = 33) and Switzerland (N = 7) participated; 396 physicians answered our case-vignettes. There was major heterogeneity of management processes related to MV within and across centers (mean IQV per center 0.51, SD 0.09). We observed the lowest variability (mean IQV per question < 0.4) for questions related to intubation procedure, ventilation of acute respiratory distress syndrome and the use of the semirecumbent position. We observed a high variability (mean IQV per question > 0.6) for questions related to management of endotracheal tube or suctioning, management of sedation and analgesia, and respect of autonomy. Heterogeneity was independent of respondent characteristics and of the presence of written procedures. There was a correlation between the processes associated with the highest variability (mean IQV per question > 0.6) and the annual volume of ICU admission (r = 0.32 (0.01 to 0.58)) and MV (r = 0.38 (0.07 to 0.63)). Within ICUs there was a large heterogeneity regarding knowledge of a local written procedure. Large clinical practice variations were found among ICUs. High volume centers were more likely to have heterogeneous practices. The presence of a local written procedure or respondent characteristics did not influence practice variation. Unwarranted clinical practice variation is common in medicine. Several studies suggest that patients with similar demographic patterns, co-morbidities, diagnoses and severity of illness receive different levels of care depending on when, where or by whom they are treated [1, 2]. Some variability may be justified by uncertainty in knowledge, need to individualize patient care and differences in case-mix, and can be related to how compelling individual clinicians find particular information . Unexplained variability in practice could potentially lead to heterogeneous quality and safety in the care of patients. Mechanical ventilation (MV) is applied to around 30% to 70% of patients admitted in the ICU . Not surprisingly, multicenter observational studies suggest practice variation in MV . Case-mix and ICU organizational patterns such as MV annual volume and processes of care used may account for the variability observed. Assessment of the heterogeneity in processes of care is not easy to capture accurately. The use of case-vignette is interesting since it is not influenced by case-mix, is easily conducted and not costly. We sought to determine whether heterogeneity exists regarding processes of care associated with MV management through a cross-sectional survey using case vignettes and whether organizational patterns or intensivists’ characteristics influence practice variation. We aimed at assessing the variability existing among the physicians at each center, and also to compare the degree of variability between centers and whether we could find a relationship with some organizational patterns. We conducted a cross-sectional multicenter survey across ICUs in France and Switzerland, members of the European critical care research REVA network. An invitation to participate to this study was sent to the local coordinators of 48 ICUs belonging to the REVA network. Our study population potentially included all physicians (including those in training) belonging to participating centers. We evaluated physician bedside practices using two case-vignettes (written questionnaire). The main drawbacks of case-vignettes are the absence of control for the conditions in which the respondents answer questions, the Hawthorne effect and the artificial nature of the cases. To minimize some of these effects we asked each center to have their participants respond almost simultaneously during one session that occurred between 5 and 16 September 2011. Some centers held two sessions, when enough respondents could not be present at one single meeting. We used two case-vignettes, written in French. One was that of a 75 year-old man with an acute exacerbation of chronic obstructive pulmonary disease and the other that of a 30 year-old woman suffering from the acute respiratory distress syndrome secondary to H1N1 flu infection. For the two scenarios, participants had to answer 26 closed-ended questions used to assess the processes of care (See Additional file 1). Questions on intubation involved the preferential method of pre-oxygenation, medications for intubation, intubation site, prevention and management of hypotension following the procedure, and processes used to check endo-tracheal tube position and the measurement of cuff pressure. Questions on ventilator settings involved regular settings for a patient with chronic obstructive pulmonary disease and those for a patient with acute respiratory distress syndrome undergoing invasive MV. Questions concerning sedation-analgesia pertained to timing (start-weaning), pain associated with endo-tracheal suctioning and daily monitoring. Questions on MV liberation and management dealt with the weaning method used, its duration and methods for prevention of laryngeal edema, prevention of desaturation during endotracheal suctioning, medical prescription of restraint, semi-recumbent position, chest X-rays, tracheotomy and plateau pressure monitoring. Questions concerning communication included physician attitude in terms of clinical decision-making (paternalist, autonomist, mixed). For each question, participants chose among four to six proposed answers, which were based on current national and international recommendations and evidence from published trials. Finally, participants answered questions pertaining to demographical characteristics (age category, gender, professional status), their knowledge of the existence of written procedures (MV liberation, sedation-analgesia recommendations, and lung protective ventilation strategy) or the ICU policy regarding assessment of two incidents associated with MV (ventilator acquired pneumonia, unplanned endo-tracheal self-extubation) in their ICUs. The case-vignettes were first tested among a small group of residents and finally validated by YLN and LB. Each ICU physician director or clinical research coordinator answered a questionnaire describing the ICU organization. The questions concerned the academic status, the number of staffed beds, the nurse-to-patient ratio, the physician-to-patient ratio and the physiotherapist-to-patient ratio. There were questions on the presence of a daily multi-disciplinary round (a round gathering both physicians, nurses and other health care professionals such as respiratory therapist, pharmacist or dietician) and whether there were written procedures or protocols for ventilation for acute respiratory distress syndrome, ventilation liberation, sedation management and prevention of ventilator-associated pneumonia; we also added questions on the existence of local evaluation of the prevalence of self-extubation and ventilator-associated pneumonia. Our study was a survey of physicians performed on a voluntary basis and did not concern patients or families. Descriptive analyses were calculated for each organizational pattern (academic status, number of beds, nurse-to-patients ratio, existence of a daily multidisciplinary round, annual number of admissions, annual number of admissions requiring MV) and respondent characteristics (age, gender, function); means (SD) or medians (IQR) were calculated for quantitative variables and frequencies (percentage) for qualitative variables. where pi is the proportion of physicians who chose answer i among the K proposed answers for a given question . The IQV can take values between 0 and 1, where 0 denotes no variation in practices and 1 means maximum variation in practices, and where 0.5 means the distribution of answers shows 50% of the maximum variation possible. First, we calculated an IQV for each of the 26 questions in each participating center. Second, we calculated a mean IQV for each of the 26 questions (mean IQV per question) for all the participating centers (see Additional file 1). We will express this value in mean (± SD). According to the distribution of mean IQVs per question (see Additional file 1), we defined questions with lowest or highest variability. A question with an IQV value lower than the first quartile of distribution was considered associated with the lowest variability. Conversely, a question with an IQV value greater than the third quartile of distribution was considered associated with the highest variability. Third, we calculated a mean IQV per center (based on 26 IQVs) to assess the global variability for each center (Additional file 1). We will express this value in mean (± SD). This index allowed us to take into account the correlation among respondents of a same center. The global variability was compared according to ICU organization patterns. Mean IQV (per center) differences according to teaching status, ICU type, country and presence of a multi-disciplinary round, were tested with a Student t-test or an ANOVA. The association between mean IQV per center and total ICU volume, volume of patients mechanically ventilated, was tested using the Pearson coefficient of correlation. We also tested the association between the practice variation (mean IQV per center) for questions with either an IQV value lower than the lower limit of the first quartile (low heterogeneity) or with an IQV value greater than the upper limit of the third quartile (high heterogeneity), and the annual total ICU volume, the annual volume of mechanically ventilated patients, the annual patients-per-physician and beds-to-physician ratio using the Pearson coefficient of correlation. Then, for each question, a mean IQV was calculated by modality of the studied respondent characteristics. Distributions of mean IQV per question in each modality were compared by the mean of paired Wilcoxon tests or Friedman tests. This analysis did not take into account the correlation between respondents in a center. The influence of the presence of a written procedure on variability was tested with the use of Student t-tests; for each topic, a mean IQV for questions relative to the studied topic was evaluated. Concordance rates between local coordinators and respondents for the existence of written procedures or for assessment of MV-associated incidents were estimated punctually and per confidence interval by a mixed logistic regression with a random effect on the center to take into account a potential center effect. Analyses were performed using R 2.14 . Forty centers from France (n = 33) and Switzerland (n = 7) participated in the study. Three- quarters of the centers were located in teaching hospitals. Their characteristics are presented in Table 1. The average annual number of patients undergoing MV was 542 ± 355 (58 ± 19% of total admissions). Q1-Q3: 25% and 75% percentiles. Three hundred and ninety-six physicians answered the case-vignettes. Their characteristics are presented in Table 2. The majority (70%) of respondents were under 41 years of age. An important heterogeneity of processes of care related to MV was found across centers (mean IQV by center 0.50; SD 0.09). We observed the lowest variability (mean IQV per question < 0.4, corresponding to the lower limit of the second quartile) for questions related to the type of pre-oxygenation (mean IQV = 0.39 ± 0.31), the selection of intubation type (mean IQV = 0.26 ± 0.31), intubation medications (mean IQV = 0.38 ± 0.29), the prescription of semirecumbent position (mean IQV = 0.23 ± 0.31), the mode of ventilation (mean IQV = 0.18 ± 0.23) and the tidal volume settings (mean IQV = 0.38 ± 0.32) for patients with acute respiratory distress syndrome (Figure 1). Respondents were more likely to use non invasive ventilation for pre-oxygenation, to perform oro-tracheal intubation, to use an association of hypnotics and neuro-muscular blockers for intubation, to prescribe on a daily basis a semirecumbent position, to select volume controlled ventilation as the preferential setting for patients with chronic obstructive pulmonary disease or acute lung injury undergoing invasive MV and to calculate the tidal volume using the formula of 6 mL/kg of predicted body weight. Processes of care associated with lowest practice variation. 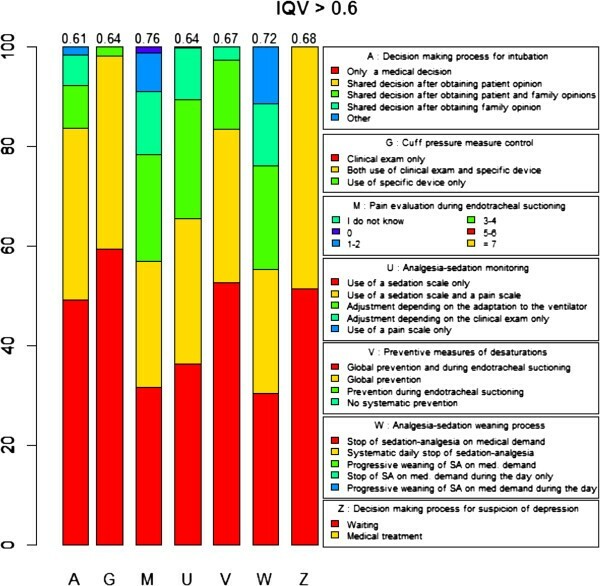 We observed the highest variability (mean IQV per question > 0.6, corresponding to the upper limit of the third quartile) of processes of care for questions related to the respect of autonomy (mean IQV = 0.61 ± 0.22), control of the endotracheal tube cuff pressure (mean IQV = 0.64 ± 0.20), preventive methods for desaturation and pain evaluation during endo-tracheal suctioning (mean IQV = 0.67 ± 0.18 and 0.76 ± 0.15 respectively), analgesia-sedation monitoring (mean IQV = 0.64 ± 0.23) and sedation weaning (mean IQV = 0.72 ± 0.22) (Figure 2). Processes of care associated with highest practice variation. There was no correlation between the mean IQVs (per center) and the ICU organization patterns such as teaching status (mean IQV 0.50 ± 0.09 versus 0.51 ± 0.10 for academic non academic, P = 0.871), ICU type (mean IQV 0.55 ± 0.10 versus 0.49 ± 0.06 versus 0.51 ± 0.11 for surgical, medical and mixed, P = 0.431) or presence of a multidisciplinary round (mean IQV 0.51 ± 0.10 versus 0.50 ± 0.08 for presence or lack of a multidisciplinary round) P = 0.648). A higher variability of processes of care was observed in Swiss versus French ICUs (mean IQV 0.57 ± 0.09 versus 0.49 ± 0.09; P = 0.048). Total ICU admission volume (r = 0.26 (-0.05; 0.53)) and MV volume (r = 0.19 (-0.14 to 0.48)) were not correlated with practice variation reflected by global IQV. We found no correlation between the questions with lowest variability (mean IQV per question < 0.4) and the total ICU admission volume (r = 0.17 -0.15 to 0.46)) or the MV volume (r = 0.04 (-0.35 to 0.28)). By contrast, the questions with the highest variability (mean IQV per question > 0.6) were associated with the total ICU admission volume (r = 0.32 (0.01 to 0.58)) or the MV volume (r = 0.38 (0.07 to 0.63)) (Table 3). The presence of a written procedure for ventilation liberation (mean IQV 0.53 ± 0.16 versus 0,45 ± 0.20 for no or existing procedure, P = 0.139), sedation management (mean IQV 0.59 ± 0.13 versus 0.63 ± 0.14 for no or existing procedure, P = 0.475) or lung protective ventilation strategies (mean IQV 0.40 ± 0.20 versus 0.31 ± 0.16 for no existing procedure, P = 0.133) were not correlated with mean IQV on specific questions. Respondent characteristics such as age (P = 0.809), gender (P = 0.960), and professional status (P = 0.145) were not correlated with IQV per center. Less than half of our participating centers had a written procedure for ventilation liberation or for lung protective strategies for acute lung injury (Table 4). There were large variation between the answers of respondents and clinical research coordinators on the existence of written procedures (Table 4). Thirty-three (83%) centers reported their own rate of ventilator-associated pneumonia and 26 (65%) their rate of unplanned endo-tracheal self-extubation. There were large variation between the answers of respondents and clinical research coordinators on the reports of incidents associated with MV (Table 4). In this cross-sectional multicenter study, we found a high level of practice variations for processes of care related to MV. This heterogeneity was independent of respondent characteristics and of the presence of written procedures. For questions with high variability, high volume ICUs were more likely to have greater practice variation. We observed a relative consensus among our respondents regarding the intubation process of a patient with acute respiratory failure and the management of a patient with acute respiratory distress syndrome. This consensus can be considered as based on evidence . The choice of volume controlled ventilation and the use of the 6 mL/kg formula to calculate tidal volume in cases of patients with acute lung injury are concordant with international recommendations and large randomized controlled trials [9–11]. The lack of consensus among physicians for sedation management is interesting since it has been the topic of numerous trials [12–14]. One quarter of the participating units did not use a sedation-management protocol. These results are similar to those of a recent survey conducted in North America  and may reflect a gap between research results and practice of critical care medicine . There are several potential reasons. First, this observation might due to a lack of awareness or familiarity with the protocols suggested in the literature. In many ICUs, sedation-management protocols are driven by nurses and physicians may not feel highly involved. Second, this might be due to a lack of self-efficacy of the protocols due to the local ICU organization or a lack of resources. Indeed, the nurse to patient ratio was 0.4 in our sample size, which is low in comparison to the study showing the benefits of the lack of sedation among mechanically ventilated patients (ratio 1:1) . Third, this might be to an attitude of lack of agreement with guidelines in general because they limit autonomy and appear as giving 'cookbook recipes’ . Fourth, the variety of answers observed among physicians about sedation management may just reflect the way people think and make their decisions. Indeed, during the last 30 years, the rational model of judgment has been overtaken by behavioral psychology discoveries suggesting that clinicians, like others, are prone to cognitive biases (such as pattern recognition, indexing keys or gist) leading to systematic and predictable errors . The lack of consensus among physicians for asking patient or family opinion on medical decisions may reflect differences in the vision of the physician and patient relationship among physicians. Indeed, exclusive paternalistic attitude used to be the rule 20 or 30 years ago in France and this contrasts greatly with the autonomist tradition observed in North America. In France, where the majority of respondents work, it is only since 2002 and the promulgation of a new law , that the consent of patients has been requested by law before conducting any invasive treatment or procedure. To our knowledge, there is no data on the influence of this law on the way French physicians make their medical decisions. Therefore, it may not be surprising that after ten years, a large practice variation remains. The presence of a written procedure does not mean that physicians will follow it. We found that the presence of a written procedure on sedation management did not reduce the practice variation. One of the underlying reasons might be the lack of knowledge of the written procedure. Indeed, we found that among ICUs self-reporting a protocol for sedation management, approximately 20% of the physicians were unaware of it. Hence, the presence of written procedures does not mean that there is an ICU culture promoting the benefits of written procedures to reduce practice variation within participating ICUs. Sinuff et al. showed in a multicenter qualitative study that the presence of a culture of guidelines within the ICU is key to facilitate clinicians’ adherence to guidelines . Another explanation may be that written procedures apply poorly to complex situations and are rapidly judged useless when addressing complex issues. The low rate of concordance between the answers of respondents and clinical research coordinators for ventilator-associated pneumonia and unplanned self-extubation prevalence could reflect a lack of quality improvement culture, a communication problem or a lack of confidence in the usefulness of such measures. Several studies suggest an association between mechanical ventilation volume and patient centered outcomes [20–23]. Kahn et al. found that medical critically ill patients undergoing mechanical ventilation had large survival benefits when hospitalized in high volume hospitals (OR mortality = 0.63 (0.50 to 0.79)) . Besides the famous adage 'practice makes perfect’, underlying mechanisms of the volume/outcome relationship remain unclear. This is the first study reporting an association between MV practice variation and ICU MV volume. Interestingly, our data suggest that high volume ICUs are more likely to have heterogeneous practices but only for processes that are not consensual (with the highest IQV variability). One can hypothesize that the larger variety of case-mix present in high volume ICUs may allow high volume intensivists to identify more easily the situations where 'one size does not fit all’ and that may explain the larger practice variation present in high volume ICUs. Then, one way to improve the outcome of patients cared in low volume institutions could be the use of simulation training in order to enhance clinical judgment skills during rare situations. Our study suffers from several limitations. First, the methods of case-vignettes may not reflect real practices, particularly if physicians answered theoretically rather than based on their actual practice. Second, we could not study the association between practice variation and patient centered outcomes. Third, although we chose two typical situations of critically ill patients undergoing MV, those situations might have been very different from the case-mix of participating centers, thus putting our respondents in uncomfortable positions. Fourth, our results may not reflect French or Swiss practice variation because our study suffers from possible selection bias. To conclude, our case-vignette study on processes of care related to MV showed a large practice variation among centers. Heterogeneity of practices was independent of respondent characteristics and of the presence of written procedures. For questions with high variability, higher ICU admissions volume and MV volume were associated with greater practice variation. Further studies are needed to better understand underlying reasons explaining practice variation. Presented partially by Nguyen YL, Ravaud P, Richard JCM, Mercat A, Guidet B, Brochard L on the behalf of the REVA Network. Mind the gap! The self-reported use of clinical protocols as a quality indicator may be misleading. 2012 ATS International Conference, San Francisco. Elodie Perrodeau and Laurent Brochard contributed equally to this work. K Asehnoune (Nantes), G Beduneau (Rouen), P Beuret (Roanne), L Brochard (Geneva), L Chalumeau (Villejuif), JD Chiche (Cochin), Y Cohen (Bobigny), F Collet (Saint-Malo), A Combes (Paris), M Darmon (Saint Priest en Jarez), F Decamps (Pau), J Dellamonica (Nice), A Demoule (Paris), J Fichet (Clamart), JP Frat (Poitiers), T Fumeaux (Nyon), S Govind (Fribourg), A Gros (Rennes), C Guérin (Lyon), B Guidet (Paris), C Guitton (Nantes), G Hilbert (Bordeaux), S Jaber (Montpellier), P Jolliet (Lausanne), Q Lu (Paris), A Mercat (Angers), JC Navellou (Besançon), D Osman (Le Kremlin Bicêtre), A Pagnamenta (Mendrisio), L Papazian (Marseille), D Perez (Dole), A Perren (Bellinzona), JP Quenot (Dijon), T Rimmelé (Lyon), L Robriquet (Lille), F Schortgen (Créteil), F Thibaut (Saint Nazaire), A Vieillard Baron (Boulogne), H Zender (Neuchâtel), E Zogheib (Amiens). Drafting of the manuscript: YLN, LB. All authors read and approved the final manuscript.